Give Your Child an "Out Of This World" Laser Tag Birthday Party at our Ballantyne or Northlake Location. You provide the kids. We'll provide the fun! When your game is ready to begin, you will proceed to the briefing room door where your Team Leader will meet you. Your Team Leader will explain how to use the equipment, how to play the game, and the rules you must follow to enjoy a safe experience. Then your Team Leader will separate everyone into teams. Next you will proceed to the Vesting Room. Place your head through the pack and tighten the side straps so that it fits snugly around your waist. You enter a strange new environment. A light haze surrounds you. Fluorescent paint glows from the walls. Red laser beams crisscross through the air. You have entered the adrenaline playground. You can feel your heart beat as you stalk unsuspecting opponents while you fear the unknown that lurks around the corner or above your head. You search for enemy base stations, fire at your opponents, and defend your own base. After what seems like an eternity, but was actually only a few minutes, you hear the end of game announcement and return to your home base to play again. At the end of the last game return to the vesting room and hang your Laser Tag vest on the appropriate hook. We can accommodate a maximum of 44 players per session (Ballantyne) and 32 players per session (Northlake). Sports Connection Marshalls will be located throughout the arena at all times to ensure all players will have an enjoyable and safe experience while playing Laser Tag. The object of the game is to score as many points for your team and for you. You can score points by Capturing Bases, Tagging Players and Hitting other targets. Your Team Leader will explain the different game scenarios and scoring options. Score cards are available at the Laser Tag Counter once your session is completed. 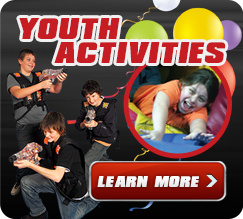 Each Laser Tag session is approximately 30 minutes long and is considered as 1 Attraction. Sports Connection Laser Tag arena can handle 24-44 players at one time. Sports Connection employees will be located throughout the arena at all times to ensure all players will have an enjoyable and safe experience while playing Laser Tag at the Sports Connection. 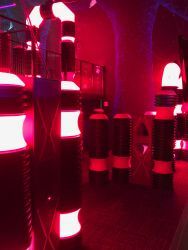 Other groups or parties may be in the Laser Tag arena during your party. All participants must bring a signed Sports Connection waiver with them to the party. Waivers are included with the Sports Connection invitations. Other parties or people may be playing Laser Tag at the same time as your party.